Somerville House01432 273991work01432 268719fax Guest AccommodationSomerville House is a beautiful, detached late Victorian villa dating back to the 1890s situated in a tree-lined residential road in Hereford offering ‘boutique’ hotel style Bed and Breakfast accommodation that blends the luxury and comfort of a good hotel with warm and friendly service. Somerville House is conveniently located – 5 minutes from the train station, 5 minutes from the bus station, 10 minute’s walk from High Town in the city centre and 20 minute’s from the cathedral and the famous Mappa Mundi. Parking is available for up to 10 cars. The spacious superior rooms with super-king beds and sitting area, and the charming top floor rooms, with intriguing beam features, all have en suite facilities, smooth and sensuous Egyptian cotton bed linen and fluffy towels and bathrobes. All rooms at Somerville House have mini bars with local offerings as well as hospitality tray with a wide selection of teas and other refreshment. The contemporary style of décor of the rooms at Somerville House contrasts with and is enhanced by the many original features – the glorious tiled entrance hall floor, the plaster mouldings (some of little angel busts) and the lovely marble fireplaces. Disabled access available and special diets catered for – please give us a call to discuss. Somerville House is a beautiful, detached late Victorian villa dating back to the 1890s situated in a tree-lined residential road in Hereford offering ‘boutique’ hotel style Bed and Breakfast accommodation that blends the luxury and comfort of a good hotel with warm and friendly service. WI-fi is available throughout all rooms, the lounge and the garden terrace. Children welcome from age 10. 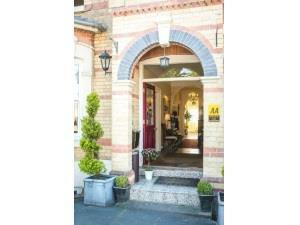 Five minutes walk from the railway and bus stations. Walk out of the town and turn right into Southbank Road and Bodenham Road. We are on the right hand side.